Manufacture: L.W. 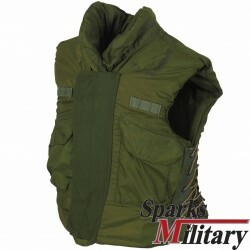 FORSTER SPORTSWEAR CO. INC.
A flak jacket or flak vest is a form of body armor designed to provide protection from case fragments ("frag") from high explosive weaponry, such as anti-aircraft artillery ("flak" a German contraction for "Fliegerabwehrkanone" (aircraft-defense gun)), grenades, some round shot used in shotguns and land mines and other lower-velocity projectiles. 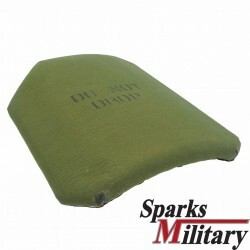 It is not designed to protect against bullets fired from small-arms such as rifles or handguns. 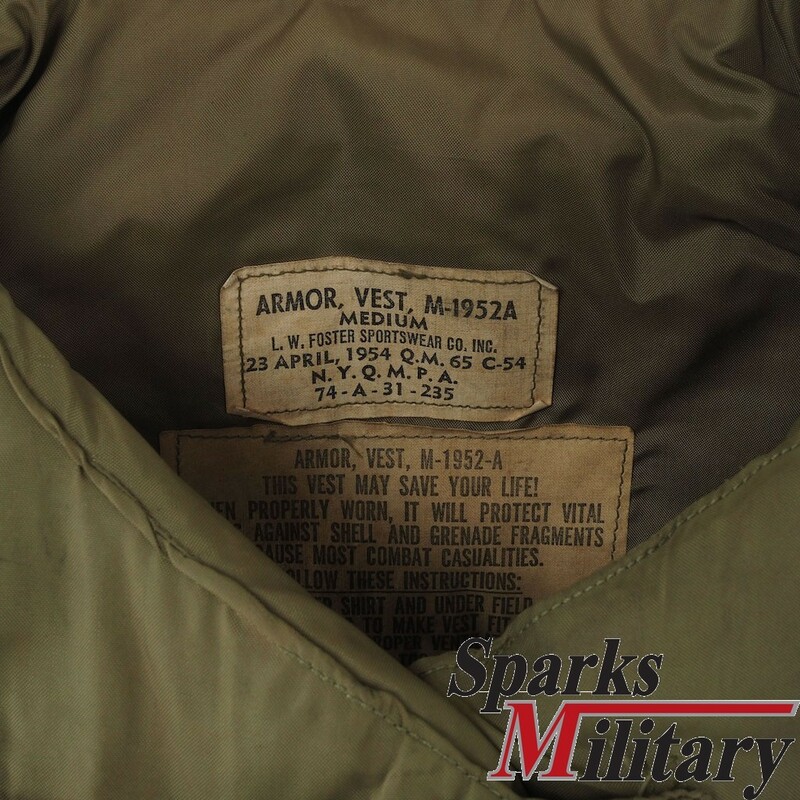 However, certain flak jackets are able to sustain certain gunshots, dependent on the armor, the gun, and the distance that the bullet has travelled. 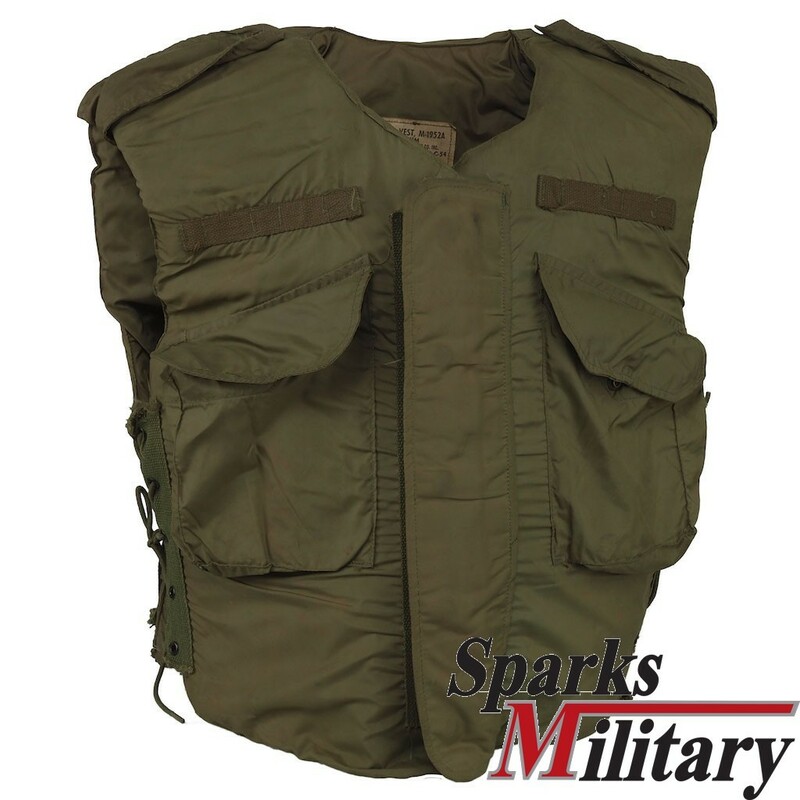 The term "flak jacket" is often colloquially applied to newer body armor featuring protection against small arms projectiles, but the original usage predated the existence of functional bulletproof vests and the two are not interchangeable in performance. 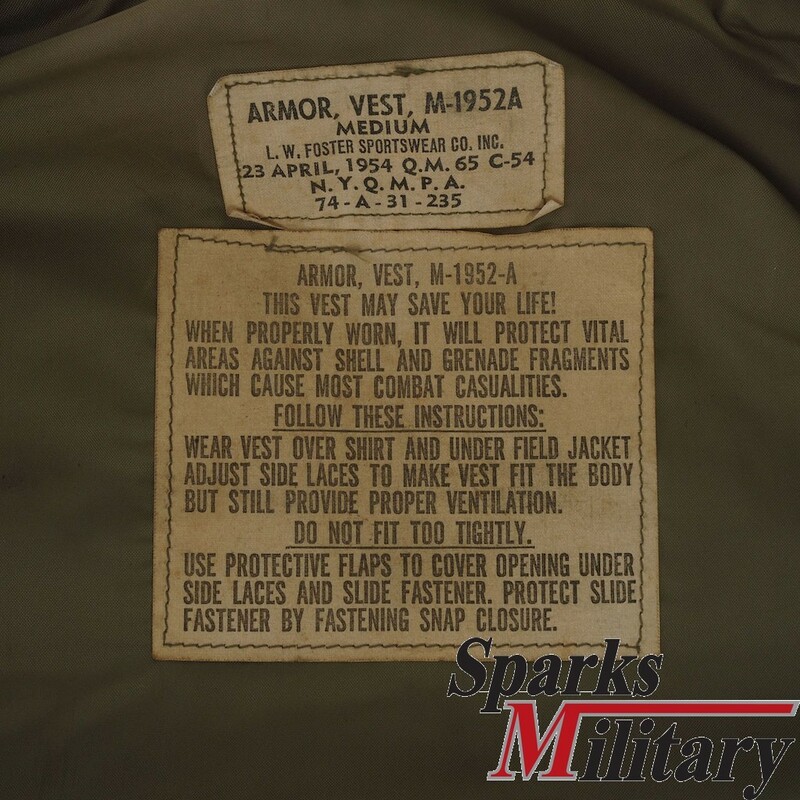 History Anecdotes describing garments designed to protect the wearer from penetrating weapons can be found far back into recorded history. 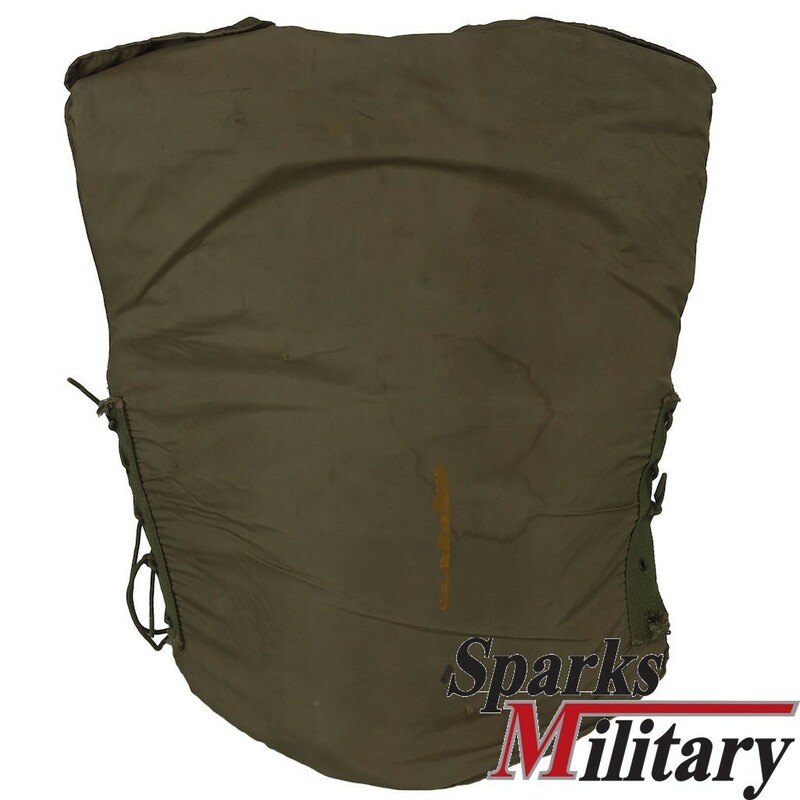 Two types of protective garment from the American Civil War in the 1860s had a basic design similar to the flak jacket or ballistic armor of modern times in that solid plates were used as the main ballistic protection. 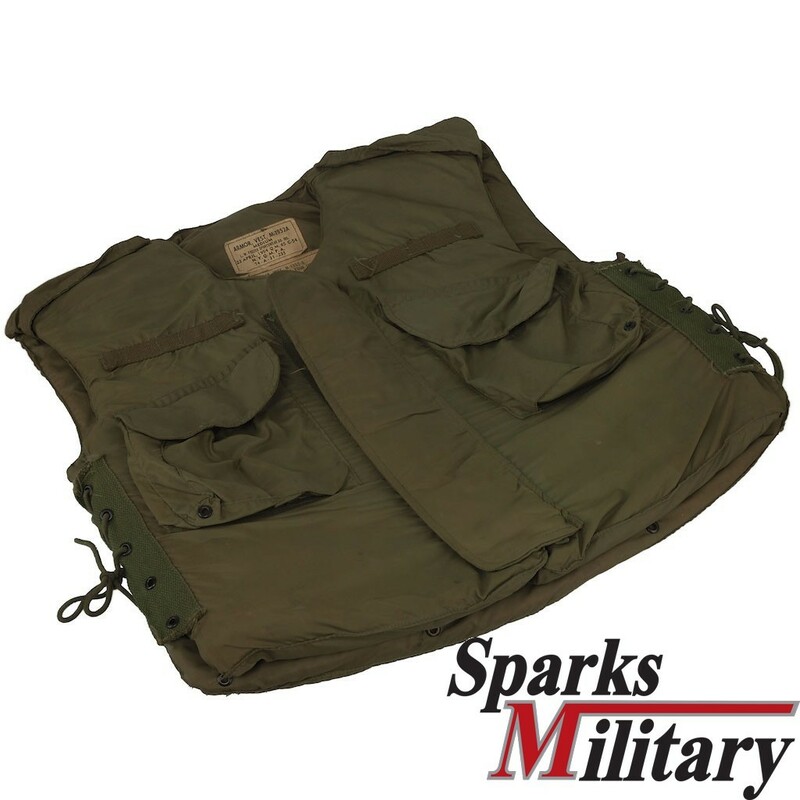 The "Soldiers' Bullet Proof Vest" was manufactured by the G. & D. Cook & Company of New Haven, Connecticut. 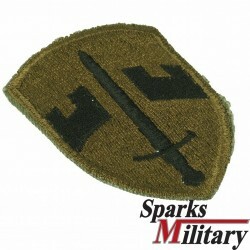 It consisted of two pieces of steel inserted into the pockets of a regular black military vest. Versions for infantry weighed 3 ½ pounds while a version for cavalry and artillery weighed 7 pounds. They sold for $5-$7. A more medieval-looking type of armor was made by the Atwater Armor Company, also of New Haven. It consisted of four large plates of steel held on the body by broad metal hooks over the shoulders and a belt around the waist. The Atwater vest was heavier than the Cook models and cost about twice as much. During World War I, a number of British and American officers recognized that many casualties could be avoided if effective armor were available. Isolated efforts at developing armor were made, and soldiers could make individual purchases or efforts, but there was no armor issued to the troops. As it is today, issues of weight, cost, availability of materials and/or environmental stability complicated the issue of developing armor that would also be effective. For example, soft armor made of silk was tried on a small scale based on Japanese designs, but this material did not last well under the harsh environmental conditions. The first usage of the term “flak jacket” refers to the armour originally developed by the Wilkinson Sword company during World War II to help protect Royal Air Force (RAF) aircrew from the flying debris and shell fragments thrown by German anti-aircraft guns' high-explosive shells (flak itself is an abbreviation for the German word "Fliegerabwehrkanone" (aircraft-defense gun)). 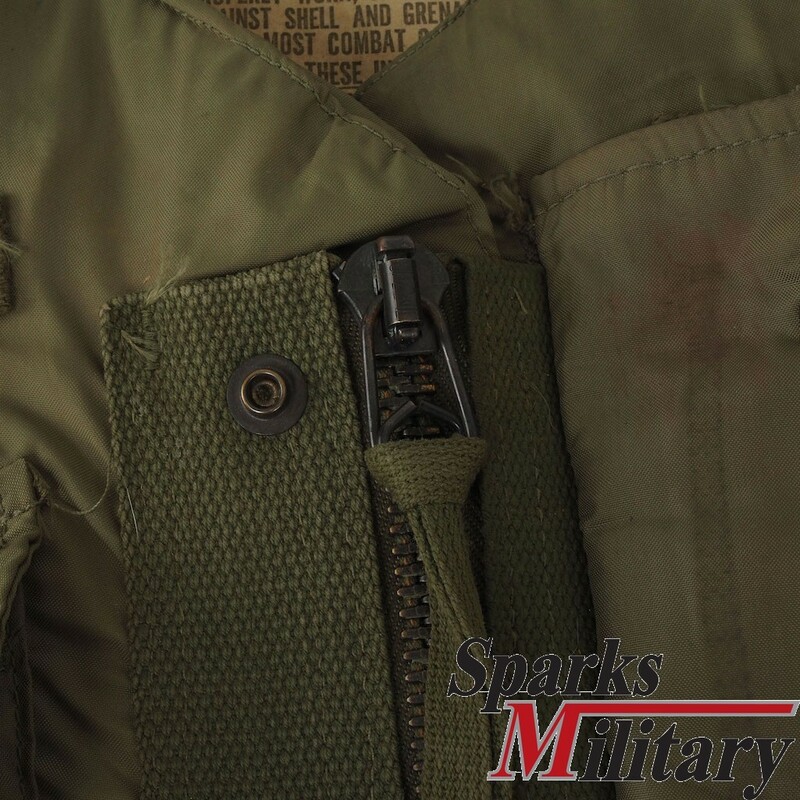 The idea for the flak jacket came from Col. Malcolm C. Grow, Surgeon of the US Eighth Air Force in Britain. He thought that many wounds he was treating could have been prevented by some kind of light armor. In 1943 he was awarded the Legion of Merit for developing the flak vest. Unfortunately, flak jackets proved to be too bulky for wear within the confines of the RAF's standard bomber aircraft, the Avro Lancaster. The Royal Air Force subsequently offered the jackets to the United States Army Air Forces, which adopted them as a Defense Standard. 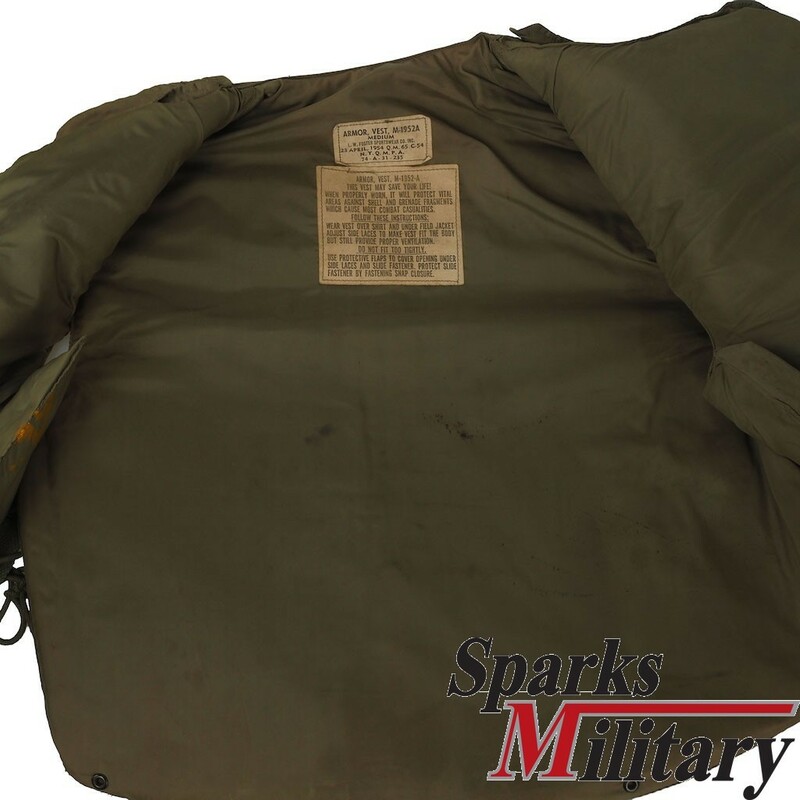 The UK subsequently supplied the USAAF with 9,600 flak jackets under reverse lend-lease. During World War II, flak jackets and steel helmets were worn by US Navy personnel on aircraft carriers during battle, since the ships and especially their flight decks offered little protection for their crew. 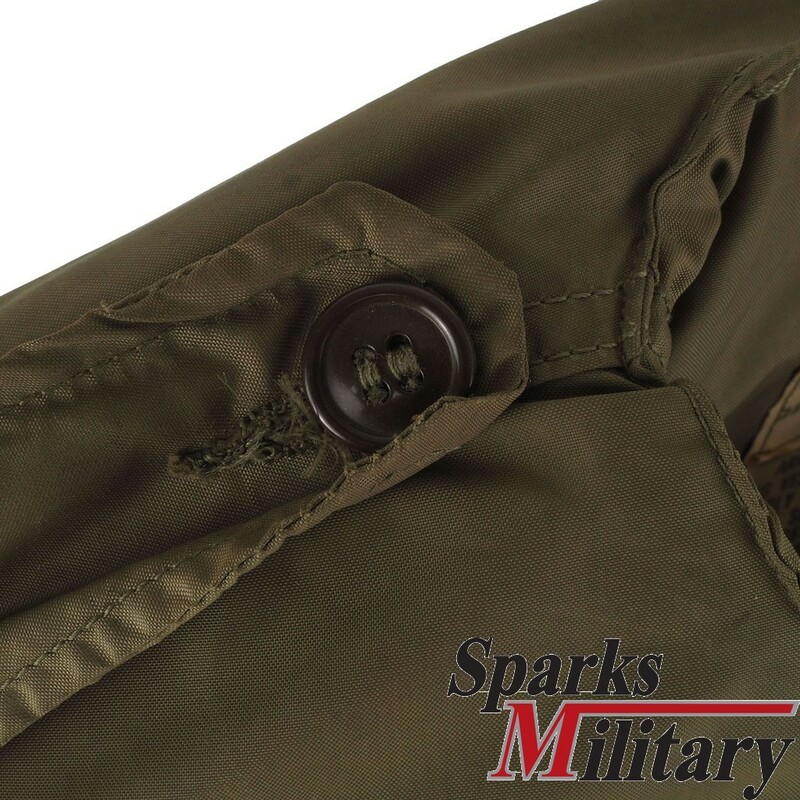 The jackets were supposed to protect against shell fragments and heat.